2013 BMW X1 facelift will be an answer to Audi's recently launched X3, but will BMW be too late by then. Audi's X3 which was launched couple of weeks ago grabbed 500 bookings within a week of the launch and hence was stopped for more bookings. Audi has said they will be ready for bookings in September - October season wherein the festive season begins. The facelifted version of the 2013 BMW X1 will get a range of cosmetic changes, which are mild in nature, indicating a mid career makeover for the hotly successful crossover. The facelifted 2013 X1 was spotted at Pune ARAI certifying agency, indicating a launch being just around the corner. The crossover will get a new front bumper, revised styling for the headlamps, new rear view mirrors, new tail lamps and a revised rear bumper.The alloy wheels too get a new design. 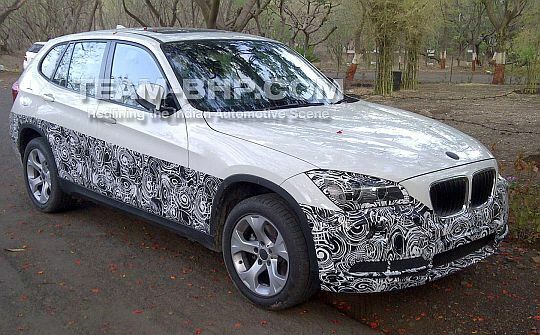 On the inside too, the 2013 BMW X1 will get a few changes to bring it up to times. 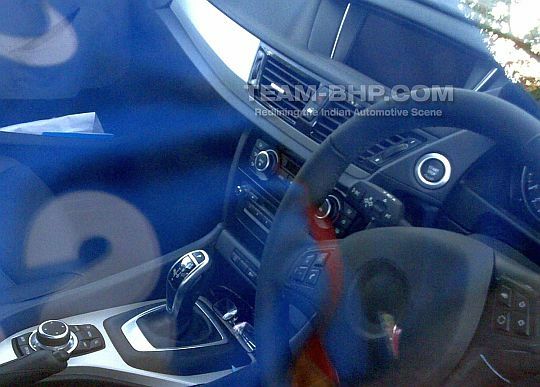 An iDrive system on the central console and a new gear shifter are what we can discern from the spyshot. The crossover might also get the 8 speed automatic gearbox, to replace the 6 speeder. The new gearbox promises better performance as well as higher fuel economy. Given that the F10 5 series and the F30 3 Series sedans benefit massively from this ZF made gearbox, the facelifted X1 too could become a much brisker performer than ever before.